A brand new 9-layer lens helps you capture the best aerial views possible. The rectilinear, curved lens design eliminates distortion, and the 20mm focal length opens up your shots to a remarkably wide angle without that fish-eye look. Packing power into such a small, lightweight design wasn’t easy, but this compact camera shoots video at up to 4Kp30 or 1080p60 and takes crisp, clear 12 megapixel stills. All of DJI s core technologies have been engineered into the Zenmuse X3 gimbal, keeping the camera steady in the sky and ensuring you get stable, professional footage every time. The 3-axis gimbal constantly draws on data fed by the intelligent flight controller, so it knows the aircraft’s flight parameters and computes the proper motion correction every millisecond. Angular velocity, momentum, inertial force and even GPS data allows the gimbal to apply countering power and force, keeping the camera perfectly level no matter how you fly. Such precision is only possible because of the ultra-fast, custom-made processor that is unique to DJI gimbals. Operating at speeds that allow the gimbal to compensate for motion and tilt in real-time, this processor controls motors on all three axes: yaw, tilt, and roll. Brushless motors that run the gimbal are built for higher precision and a longer life, all while handling the stress of flight. They operate at a high control speed of 120°/s for tilt and 180°/s for rotation. You can also control where the camera is pointing with over 360° of rotation and -90° to +30° of tilt, all within ±0.03° of accuracy. Upgradeable to Inspire X5 Series,and usable with the DJI Osmo. Rotate and tilt the camera by tapping the screen and dragging your finger wherever you want to look. 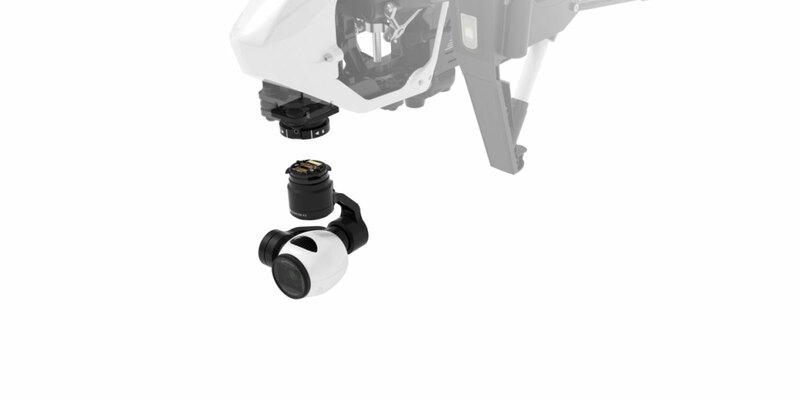 The Inspire 1’s full 360⁰ range is literally at your fingertips, and with one simple motion you can see and record images behind, below, and even slightly above wherever you are flying. The advanced app responds to your commands immediately, bringing a whole new level of control.